It is now 12 years since I saw Amir Khan win his Olympic lightweight silver medal in Athens as a bright-eyed 17-year-old who was Britain’s lone ring representative. Those years were always a fascinating roller-coaster ride featuring a brilliant but brittle boxer whose unbounded bravery could become his undoing. There are many who now think this will be the case when he meets the granite-hard Mexican slugger Saul ’Canelo’ Alvarez in Las Vegas on May 7. But equally there are a growing number of pros in the game who are now giving 29-year-old Khan at least a fighting chance of causing a sensational upset in what is certain to be the most intriguing match-up of the year. Even Carl Froch, who rarely had a good word to say about Khan when they were fellow fighters, is among those who can see sense in the match for the WBC middleweight title. He says: ”You’ve got to give Amir Khan credit for taking such a dangerous, dangerous fight. I was as surprised as everyone when I found out that he’d be taking on Saul Alvarez but the more I think about it, he can definitely pull off an even bigger shock and win. 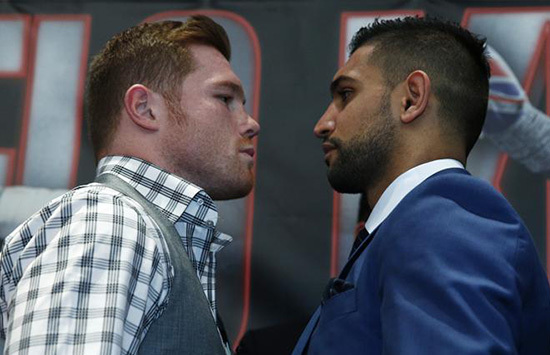 To take Canelo on – conceding up at least 10lbs in weight – deserves the utmost respect and for the fans it will be a great fight. For Khan, it will be a huge risk but I honestly think he can win this. “If Khan uses his speed and his range and stays on his toes for the full 12 rounds, he has a real chance. He has great boxing ability – we know that. Tyson Fury and David Haye are also among those who decline to write off Amir Khan as surprisingly, is Kell Brook, who misses out on a massive pay day because of Khan’s decision to snub him and go for an even bigger fighting fish, in every sense. That’s how I now see it, too. If it was Gennady Golovkin Khan was fighting rather than Canelo I’d say he had no chance, but against the slower-moving Mexican, while the odds are long, it is not an impossible dream. As long as he doesn’t let his instinctive bottle get the better of him and concentrates on staying out of harm’s way. A fourth round ko by Danny Garcia in 2012 brought a third defeat for a fighter whose jaw is frighteningly fragile. But he seems less vunerable these days. He claims the long break from boxing, due largely to being jilted first by Floyd Mayweather jnr then Manny Pacquiao, have accumulated rust. “Look, God does things for a reason, and it’s not really affected me. The last 12 months haven’t been as if I have been sat at home. I have been in camp; working hard and taking that time off sometimes makes you metaphysically and mentally a better fighter. We’ll see how much better fighter I am on the night. To win this critical encounter Khan must shake off that rust, recapture the blistering hand speed of his earlier days, keep his chin down and his wits about him. But many still fear for him. He stands at the watershed of a turbulent career. 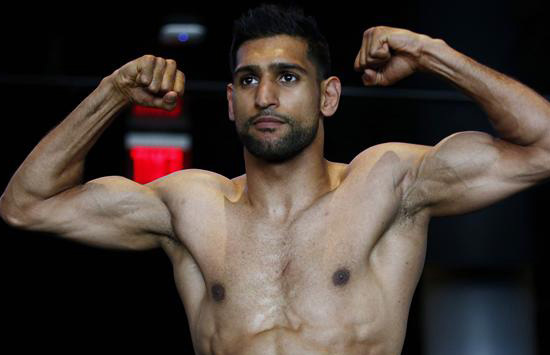 Khan claims that if he loses he can move back down and fight Kell Brook but that is not a given. If badly beaten he could find himself with nowhere left to go and that Olympic medal and world titles will be a sadly distant memories. I have known and liked Khan since his schoolboy amateur days, watching him become a shining beacon for racial harmony and community relations. But whatever happens at least Alvarez v Khan will be a true blockbuster, fight to remember, and the boy from Bolton should be applauded for having the balls to go for it.